This is a post for the Big Stars on the Small Screen blogathon. The titles and actors I chose to cover are Robert Loggia as Elfego Baca, and Leslie Nielsen as The Swamp Fox (Tomorrow). Both of these television narratives aired in rotating fashion on an ABC program called Walt Disney Presents from 1958 and 1960, at the tail end of what some refer to as the (first) Golden Age of Television. The structure of Walt Disney presents was such that the stories told were inspired by any of the four sections of Disneyland at the time: Frontierland, Fantasyland, Adventureland and Tomorrowland. Both of the series I will discuss dealt with tales inspired by Frontierland, the same section of the park that brought Davey Crockett and Daniel Boone (’60) to the small screen. The modus operandi of said show was stories inspired by figures in American history. Now many projects from the Walt era are vaulted by Disney and not frequently available, especially these serialized show-within-shows. However, there was a time (and I think that it should return) when Disney Treasures released a series of tin-cased box sets in limited supply that would be of interest to collectors and Disney fans. This was one of the selections, one that I was able to obtain via the Disney Movie Club. The unfortunate part of the packaging is that you are not provided here with the whole run of the show on these discs. Since they’re DVD releases and an hour-long show there are but three-episodes per show. In one case the selection closes a chapter, in another it feels more like a prelude. Having said all that, both these shows feature early-career performances of two actors who have had varied and successful careers: Robert Loggia played Elfego Baca and Leslie Nielsen played Robert Marion, a.k.a. The Swamp Fox. The insights gleaned to this show, and the story behind it are better in general and not just because there is a supplemental interview with Loggia that gives further background to the series and his involvement. Firstly, in narrative terms, these short tastes of series give an interesting insight into lesser-known figures in the US’s past. In Baca’s case it’s even more interesting because he was a US-born and -bred bilingual Mexican-American. He lived in the frontier lands and built a legend of having “nine lives” and a unique sense of justice. He eventually, mostly through self-teaching, became an attorney. We first meet him as a self-appointed deputy standing up to a group of bandits. Then he comes into the fold as a full-fledged deputy. In cultural terms, the mere depiction of an ethnic character in later 1958 and early 1959 is quite a big deal, much less making him the hero. Surely, he was a historical figure but there was nothing forcing Disney’s hand to tell his tale. While the interview between Leonard Maltin does reveal that casting was down between Loggia and Ricardo Montalban, and what tipped the scales his way is not discussed -especially considering Montalban seemed to have an in. However, with Loggia being cast Baca’s heritage could’ve further been buried but it was the actor’s option, per his telling, to accentuate the ethnicity more than even the script would with an accent. He also passably slips into Spanish here and there which makes it a unique take. Cross-ethnic casting is a double-edged sword, and was more common in this day-and-age, but it’s not something that can be held against Loggia if you disagree with it on principal– he had a job to do and did it very well. Loggia ’s break here is one he describes as very fortunate. He was an athlete in college and had served in Korea. He was working on Broadway in fairly short order and then was picked by Disney to play this role. 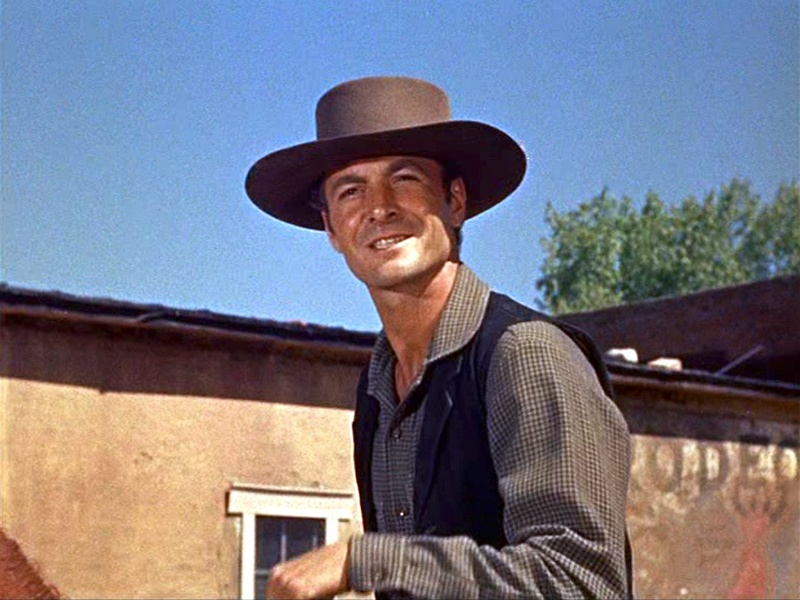 The cowboy elements, a hefty portion of the role, were things he learned to be able to play it, which is impressive as there is quite a bit of riding and action in a western-set tale. He also worked with legendary stunt people and did quite a few of those stunts himself and made his portrayal seem even more authentic than it would have otherwise. Of course, as referenced above, with access to only 30% of the series it’s impossible to get a sense of the totality of the series. The IMDb does indicate the further addition of Latin actors later on. However, not only is Loggia, who in the minds of many is the willing participant in a Family Guy cutaway, or the boss in Big; great in a very different kind of role here. There are some important things of note in this show additionally such as Native Americans appearing with Baca in a scene as an ally, Baca’s betrothal and marriage to a Caucasian woman. Loggia in discussing Disney’s influence on the production stating that he “knew everything,” which reaffirms my assertion that he was one of those producers who had their fingerprints on their films. Loggia’s memories were always fond it seems. Of course, he was on a parade float in Disneyland in ’59 so I assume it would be. And like many Disney alums he returned many years later this time voicing a character in Oliver and Company. 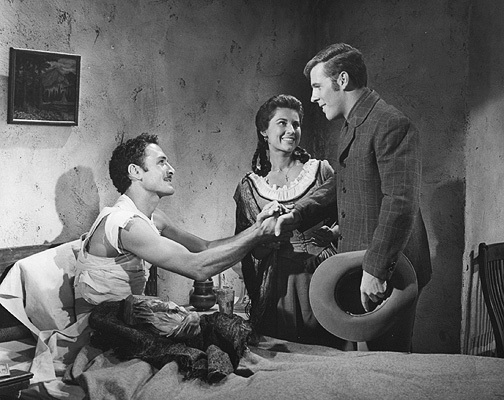 Furthermore, it set the stage for Loggia in his career he played many varied ethnicities. It became one if his calling cards. Of course, being a character actor to some extent and having a bit of chameleon about him it made him one of those actors you knew, but maybe not necessarily from what film. However, many actors will take that, when you can be any number of people to moviegoers that’s a pretty great thing. To me, he may always be Skeletor first and foremost. CHeck back tomorrow for the post on Leslie Nielsen!